Making homemade butter used to be a necessary and lengthy process. Today we have the luxury of picking up our butter at the supermarket, but every once in awhile I decide to whip up a fresh batch at home. It literally takes less than 10 minutes to make when you use a stand mixer and the taste is more than worth the small effort. Wow your family by serving them up some homemade butter alongside your next batch of homemade bread! The process begins very much like making homemade whipped cream — only instead of adding sugar, you’ll add a touch of salt. 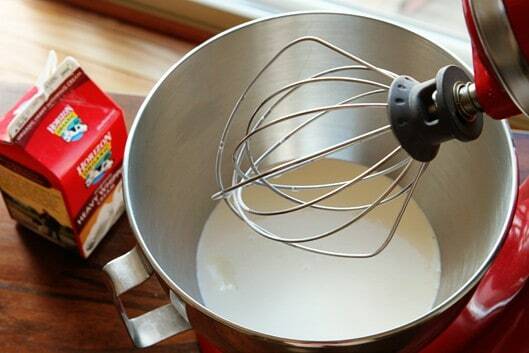 Fit your stand mixer with the whisk attachment and start whipping on high. The cream will whip up and then deflate. At this point, you may want to wrap a towel around the top of your mixer to avoid having buttermilk flung all over your kitchen. 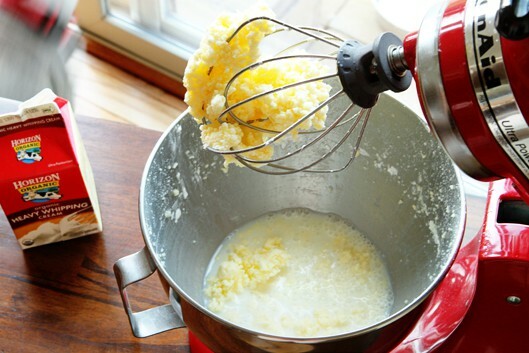 Depending on your mixer, in about five minutes or so you’ll end up with a whisk full of butter! At this point you can drain off the buttermilk, and then you’ll need to wash the butter. Mix and knead your homemade butter in a clean bowl under cold water until the water runs clear to remove any excess buttermilk. Removing all of the buttermilk is essential to keeping your butter fresh longer. Add heavy cream and salt to your mixing bowl. 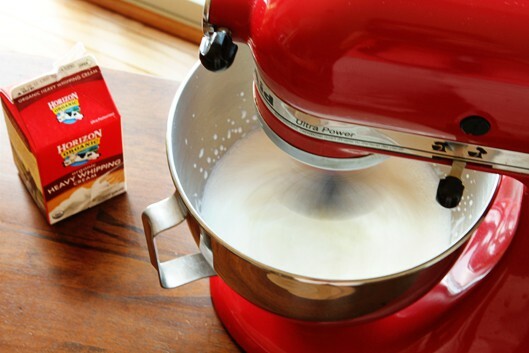 Fit your stand mixer with the whisk attachment and whip on high for approximately 5 minutes. The cream will separate into butter and buttermilk. Pour off the buttermilk and rinse and knead the butter in a clean bowl under cold water until the water runs clear. Keeps for up to 2 weeks when refrigerated. I’ve made butter a couple of times now. The wife said that she couldn’t taste any difference between the home made butter and the commercial stick butter. I was a little disappointed… until we ran out of the home made butter and she opened a stick of store bought. She tasted the difference. Guess I’d better not run out anymore. Now she really likes the home made butter. Made some more today; two quarts of heavy cream worth. I made this this afternoon using my immersion blender, and it came out great, although it did not turn yellow as yours is in the photo. I’ll make this whenever I need unsalted butter, as I rarely need that and don’t generally keep it on hand. I have the buttermilk saved for the next time I need to dissolve cornstarch in liquid for gravy to give it more punch. After purchasing butter from the Amish folks at the local Farmer’s Market, I decided I am going to venture into making my own butter. The fresh stuff was just too yummy to stop using. Does it HAVE to be rinsed? I saw a comment above that said it didn’t but, well, opinion? Also, I have a Ninja mixer/blender. Would this work for “churning” the cream or does it have to be a hand mixer? Hi Susan! If you’re going to use it all immediately, then you would not necessarily need to rinse it. However, if you’re planning to refrigerate it and use it over the 2 week period, rinsing is critical for keeping it fresh for that timeframe. And yep, you can definitely make it in a blender, as well. Enjoy! Ive heard you cannot used ultra-pasteurized heavy cream. Thats all I have at the store, I was sad. Maybe someday I can find heavy cream somewhere that I can use. Melissa, ultra pasteurized heavy cream is a little more difficult to whip into whipped cream, but it still works. There’s no reason why you shouldn’t be able to use it to make butter though! Oh my goodness!! It’s SO GOOD!! :D I can’t believe how fun and easy that was! At first it took a while, and all of a sudden – BOOM! butter and buttermilk. To cool !! I’m all over this like flies on um well… lets just go with bees on honey. Thanks so much. I always use unsalted butter in my cooking – even though you only add 1/4 tsp of salt to the mixture, will this have a similar taste to unsalted store-bought butter, or is the taste closer to the “salted” kind? You can certainly leave the salt out for unsalted butter, Leah! It won’t affect the butter forming, so you can add as little or as much as you’d like. My kids and I made this several times over the summer. We used empty clean baby food jars and we shook away. The kids had a blast watching it form. They had no idea they were learning as well! LOL. They were so proud of what they had done that every time we ran out they asked if we could make it again. It’s easier than using a mixer because u don’t have to clean up anything! I am a soon-to-be Stay-at-home Dad, and I have been trying to find ways to make mealtimes less expensive as well as be able to know exactly what my family is ingesting. I got Heavy Cream from Aldi and it was $1.29/pint at that price it makes approximately 1 lb of butter for $2.58! The cheapest I have found stick butter in the stores is around $3.00 and this was so much better tasting! Thank you so very much for this recipe as my daughter is a butter hound and plows through it all the time. I am looking forward to trying other recipes on the site. Thanks again! Thanks so much for doing the math for us, James! I keep meaning to break everything down, but this summer has been pretty hectic for us. I’ve always just put the whole box in the freezer when I’ve frozen it, and I haven’t had any problems. You might consider freezing the butter that you intend to cook with and just purchasing fresh butter for spreading. Wow… I always run out of butter early in the morning where the groceries are still closed… thanks for the tip. yes you can. I don’t know about ‘recommended’ timespans, but I have frozen butter for up to 6 months and it was fine on thawing. I made the butter in my blender, just pour in the heavy cream and beat on high for about 10 mins. you will know when it’s done, it all clings to the beaters…remove the butter , put in bowl and you can wash it or not…I did not…it just makes it last longer they say…..but out of a quart of cream, I probably got 8 oz. butter…and that doesn’t last long….so I wasn’t worried about it lasting……you will eat it all before it goes to waste anyways….. Sorry about saying I made it in the blender…I meant to say I made it in my mixer…sorry about that…..
Hello I was wondering can I use a blender ( like the one you make smoothies in) to make Butter? And when iget the heavy whipped cream is there a process I have to go through before I can mix it? Thanks for the post too! I’m guessing a blender would work as well, but I’ve not tried it myself. You don’t need to do anything to the heavy cream — just follow the instructions above. Make my OWN butter? So cool! Thanks, I will definitely try this out! 2) To make the butter last longer (and to help those with dairy alergies), I clarify my butter. Simply put the butter in a bowl with slanted sides. Heat in oven until it separates. Skim the top off and put in fridge. After it hardens, pry it out of the bowl and wash off. What’s left is clarified butter, also known as ghee. Great suggestions — thanks, CJ! One other thing, where do I purchase “Heavy Cream”? Thanks for stopping by, Lovelie! If you don’t have a whisk, mixer or blender, you can also make butter by pouring your cream (and salt if desired) into a mason jar and shaking it. It takes longer and requires more manpower, but it yields the same results. If you have kids, they will have a blast shaking it for you! If you are making the butter in a jar, put in a couple of marbles and it will shake into butter faster. Just remember to remove ther marbles before eating! I wouldn’t use marbles as they can chip and you end up with glass splinters in your butter – not much fun. Oops, I forgot to answer your question about heavy cream. Heavy cream is the same as whipping cream — you should be able to find it at any grocer. Add a clean marble or two to the mason jar and the process goes much faster. Plus, you can hear when the marbles stop moving and know the butter is ready to be washed. We “pass the jar” in our family so no one gets too tired of shaking. I wouldn’t use marbles to make the butter as they can chip and you end up with glass splinters in your butter – not much fun. How clever and how awesome this is. Thanks for sharing. I am so happy I found this. Hi, I’ve come over from Money Saving Mom. A while back my son’s cub scout troop made homemade butter by hand; taking turns shaking the container. It was a lot more work, but it was fun for the boys and it was the BEST butter I had ever had. One cup of cream produces about 1/2 a cup of butter which is the same as a store bought stick of butter. So you’d need four cups of cream to yield about a pound of butter. Quick question : If you wanted to add any flavoring to it (ie: honey butter or cinnamon butter) at what point do you think it would be best to incorporate that? When I made my butter this way I added the cinnamon and honey at the beginning and it turned out great. wouldn’t the honey wash out during the washing part? By the way, if you don’t want to use the left over ‘buttermilk’ for cooking or baking, it is great for your garden too – good for beneficial soil micro-organisms, just pour it over the soil around your veges. Or you can use it (with a few drops of dishwash liquid) to spray for powdery mildew – but do it after the sun has gone down as the milkbacteria, that do the good job of eating the mildew, get killed by sunlight. I think traditionally you would add them to the butter after you’ve finishing “washing” it to avoid losing any flavor. But Jamie mentioned that she’s added it at the beginning, so it might be fun to experiment! I’ve never done this before. How do you wash and knead the butter? I’m trying to figure out how to keep it from going down the drain or running through my fingers. Jenni, you can just place it in a bowl and add clean cold water too it. Then knead it in the water, drain off the “dirty” water, and repeat until the water remains clean. The butter is pretty firm, so it definitely won’t run through your fingers. Lol I was thinking the exact same thing! LOL, I guess I need to update the post to make that more clear. Sorry for confusing you all! Looks like a really neat thing to try, and super easy, too! Thanks for sharing this, and I have pinned it, as well! i think this is so great…but i’m wondering if this is more cost effective than actually buying better. it doesn’t seem like it yields as much. I’ve seen some pretty good deals recently on butter with coupons, but for the most part, this does work out to be more economical in the long run. I’m sure many people would be willing to pay more for the convenience of pre-measured stick though. What kind of yield do you get? In other words, a pint of cream will make approximately how many tablespoons or ounces of butter? Katie, a cup of cream yields about 1/2 cup of butter — so it’s basically equal to a stick of store bought butter. I am reading Little House in the Big Woods to my little girls and read the chapter where they make butter last night! What a great tie-in! I’m planning to read that series with my girls this summer — so looking forward to it. Hi Danielle! Yes, you can absolutely use a hand mixer. It’s slightly more hands on work and may take just a tad longer, but it works the same way as using a stand mixer. You can also “shake” this by hand. We did this at my daughter’s school for Thanksgiving. You put it in an airtight container, small enough for the cream and salt. You just keep shaking it. After a few minutes, you’ll be able to tell it’s getting thicker. A few minutes more, and there you have butter! I am still waiting on a stand mixer to come into my life, so I used my hand mixer this weekend. It took about 20 minutes, longer if your mixer is junk and has to take a break frequently to let the motor cool down. Is the leftover buttermilk truly ‘buttermilk’ that you could use to cook/bake with? If so, how long can it be kept in the refrigerator before going bad? Thank you for the article! I look forward to trying this soon! Good question, Wanda! It’s not truly buttermilk that has been cultured like you’d pick up at a store. That said, if you don’t want to throw it out, a good use would be to replace the water in your favorite bread recipe with it. It’s also good as the liquid in making cornbread. Add a tsp. of soda as well as baking powder. The girls and I do this all the time. We use raw milk. I wish I could still buy raw cream at the market, but the vendors moved on, I guess.